Putting food on the table for the family quickly and economically doesn’t mean you have to compromise on quality. This book shows how Hugh’s approach to food can be adapted to suit any growing, working family, or busy young singles and couples for that matter. 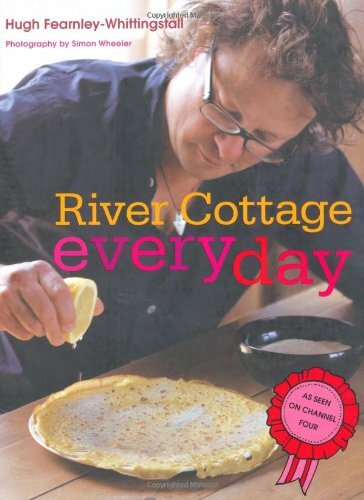 Breakfast, baking, lunchboxes, quick suppers, healthy snacks, eating on the move and weekend cooking for the week ahead – all these, and more, will be covered in River Cottage Every Day. ‘I make no prior assumptions about where you shop, what you may or may not know about growing vegetables or keeping livestock, whether you can tell the difference between a swede and turnip, or know what to do with a belly of pork and a breast of lamb. Instead, I’ll show you easy and confidence-inspiring ways with cuts of meat, types of fish and other ingredients you may not have tried before. And I’ll offer you new approaches that I hope will breath new life to familiar staples, like rice, spuds, beans, and your daily bread.